New software helps promote early literacy. 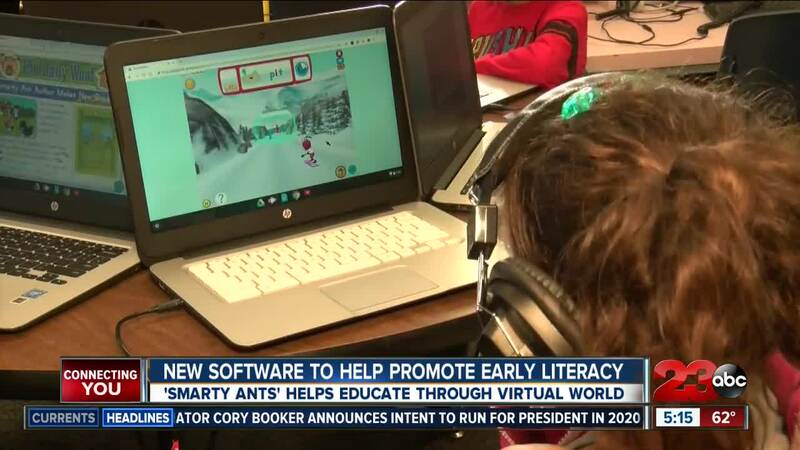 BAKERSFIELD, Calif. — A new way to learn, the Bakersfield City School District is working with a new software that helps promote early literacy for kids ages 3-5. The software being used is called Achieve 3000 but for kindergartners, they start with the program SmartyAnts. A fun and interactive tool that just seems like a game. For the first time this year, a kindergarten class at Jefferson Elementary is using the new software SmartyAnts. “It’s an online literacy-based program that places each student at the learning levels specific to their needs,” said Mrs. Reyes. The program personalizes the learning lessons and also makes it a fun process for the students. “Each student gets an avatar ant and they use it in their virtual game. The program places them at a level with an initial assessment based on their needs,” said Mrs. Reyes. It’s a virtual world that feels like they are playing a game but it’s more than just a game. “They are really excited to earn more tokens. They tell me how many points they have and they have their tracking system to see where their ant is. It’s exciting and they enjoy learning,” said Mrs. Reyes. After kindergarten, students move from the SmartyAnts software to the Achieve 3000 software all the way through eighth grade. The Bakersfield City School District says that two-thirds of the schools have SmartyAnts and by next year all of the schools will. It is also available for free to all students ages 3-5 living in the district. They just need to visit the school in the area.